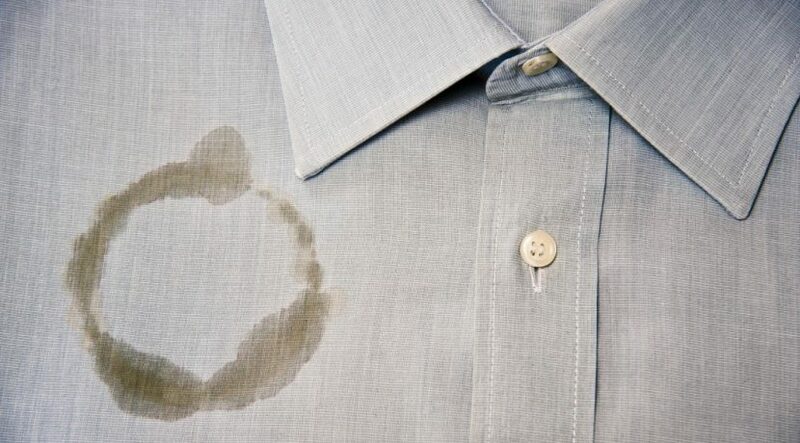 Who doesn’t have grease stains on numerous articles of clothing and probably on something else too – maybe the carpet or sofa? Haven’t you bitten into that juicy burger just to have a squirt of juicy deliciousness fall right into the lap (with some ketchup and a big slice of tomato) of your favorite sundress/best capris/cutest shorts? I find grease to be public enemy number one when it comes to stain producing items. After all, if we eat a couple of meals a day, or cook a couple, we’re going to have grease stains on our own clothing and our family’s clothing. Dawn dish detergent used as a pre-treatment to washing takes out greasy stains. Add 1/4 cup to the washer during the wash cycle for extra insurance. Shampoo rubbed into a grease spot will remove even old stains. Rub Lestoil into a stain and wash.
Soak grease stained clothing in a mixture of automatic dishwasher detergent and water overnight. The next day wash the clothing with laundry detergent. You can also add some dishwasher detergent to the washer if the stains were really bad. Spray grease stains with WD40 and let sit. Rub some Dawn dishwasher detergent into the spots and then wash. Put some cornmeal, flour, cornstarch, baby powder or baking soda on the spot after you blot off the excess grease. Wait a while and brush off the solids. Then use a stain remover and wash.
Add Simple Green to your laundry after you pretreat with Dawn Detergent. This works great, especially on grease that comes from petroleum products like the kind you might get on clothing after working on the car. AND Coke can be poured directly onto grease stains. Let the item sit a few minutes, pour the rest of the Coca Cola into the washing machine and wash. Coke? My son, the professional chef, swears by Carbona’s Stain Devils. He says they’ll take cooking grease out of anything. Put a powdery substance on the spot like the ones mentioned above: cornmeal, flour, cornstarch, baby powder or baking soda. Let it sit until it appears that the stain has been absorbed by the powder. Then use a scrub brush and some water and detergent or upholstery cleaner to scrub the grease stain. Wipe it all off with a damp cloth. Mix up a half and half combination of hydrogen peroxide and ammonia and spray it on the stain. Keep spraying it on the stain and blotting it off until the stain is gone. Mix half vinegar and half water and see above. Sprinkled salt on the stain and let dry. Then vacuum it up. If somebody got grease on the upholstery chances are pretty good they got it on the rug, too. After all, where does that rib end up after it bounces off your white pants onto the sofa? Dab on some rubbing alcohol (after you remove the bone and as much BBQ sauce as you can!). Keep it up until as much of the grease is gone as you feel you’re going to get up. Mix a little water and a little dishwashing detergent. Spray this on and blot it up until the spot is all gone. Mix up one cup water and one cup white vinegar and spray it on grease stains on rugs. Blot, blot, blot and treat again. You can try peroxide instead of white vinegar and use it the same way as above. While none of us like to spend our days removing grease spots from laundry, upholstery or rugs, it certainly is more fun if it’s fast like all of the tips above. So give them a try. Or even better, get your husband to give them a try. I’ll bet he made some of those grease stains!